You are here: Home / Blog / Man Bouquet — Perfect for Father’s Day! 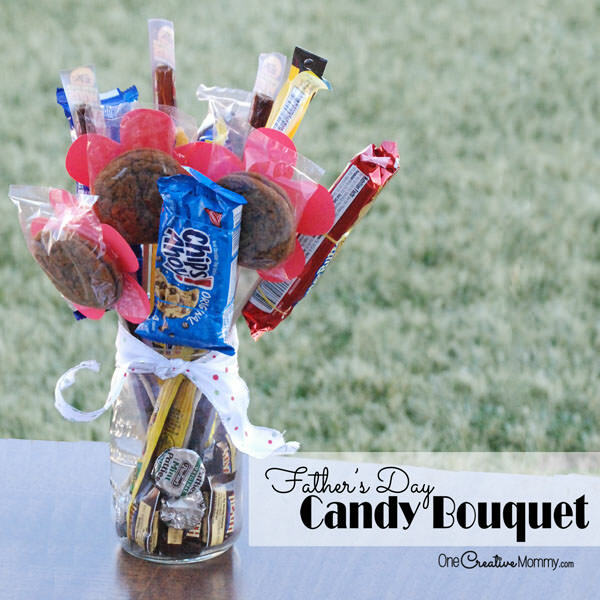 Man Bouquet — Perfect for Father’s Day! 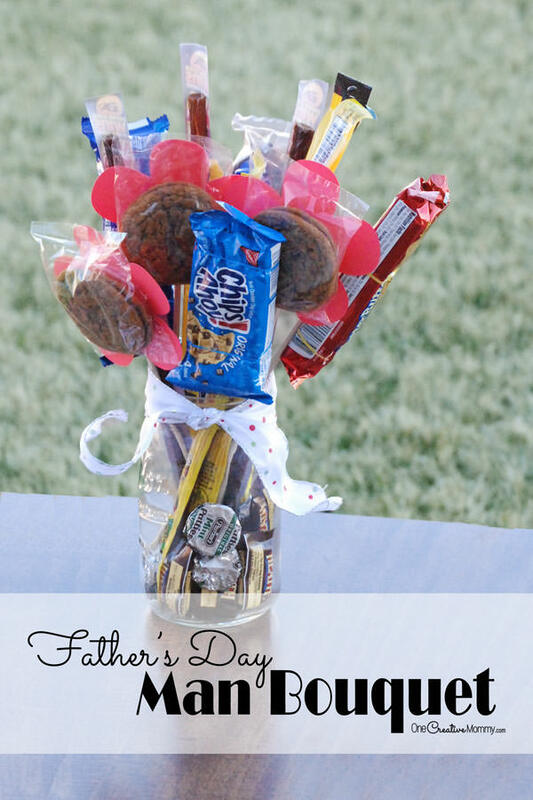 Just in time for Father’s Day and the end of the school year, I’m sharing how to make this tasty DIY Candy Bouquet. 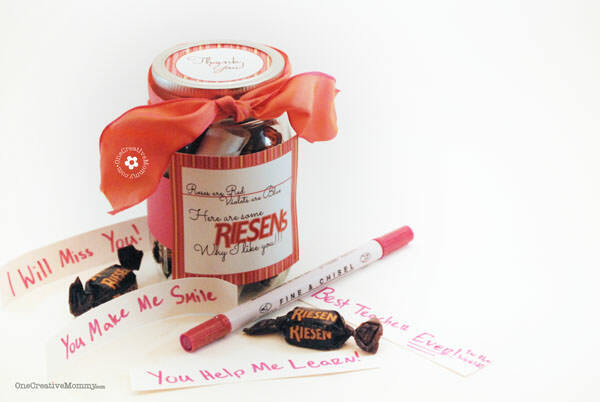 It’s a gift idea that’s perfect for dads, teachers, and anyone with a sweet tooth! Originally a “Man Bouquet” Valentine gift for my hubby, I hope this project is perfect for someone on your gift list! Favorite treats! (Tall, skinny stuff and a few round treats.) 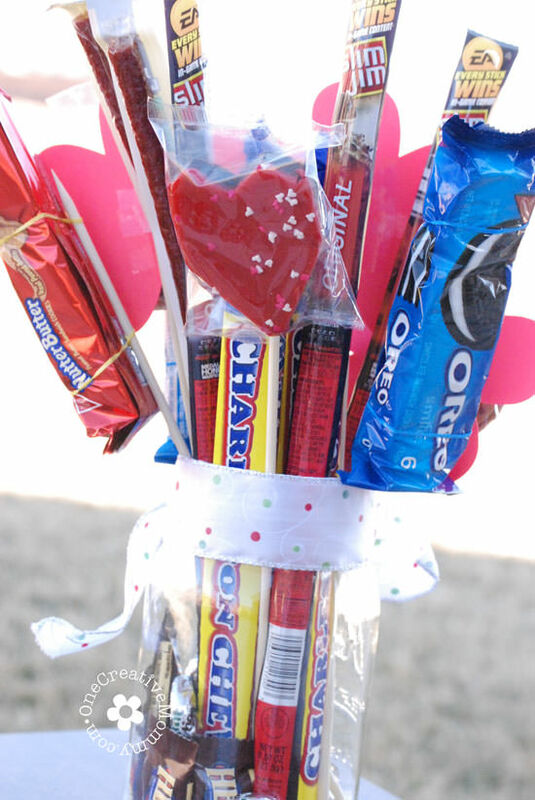 I used beef sticks, cookie snack packs (Oreos, Nutter Butters, and Chips A-Hoy), Charelston Chew Candy Bars, Valentine heart snack cakes, and Little Debbie oatmeal cream pies. I also used tiny treats to fill the bottom of the jar. Using rubber bands or hair ties, attach the skinny packs of cookies to the skewers (pointed side up). Cut large flower shapes out of the card stock — making sure they are larger than your round treats. 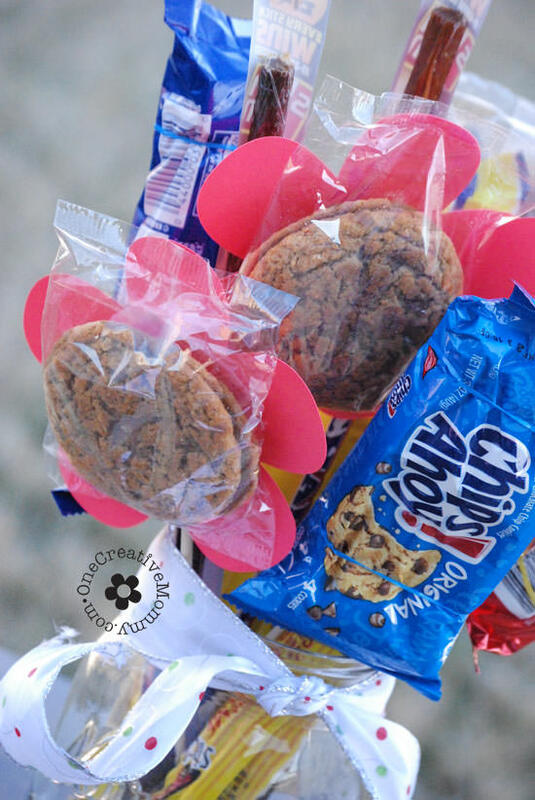 Attach the treats to the flowers with glue dots or a strong glue. Fill the bottom of the jar with tiny treats, and then carefully slide in the beef sticks, Charelston Chew bars, and skewer-topped treats. Tie a ribbon around the top of the jar. Viola! You’re done. If you are giving the gift to your hubby, now comes the hardest part. After delivering the gift, restrain yourself from sneaking treats while he’s at work or school! You can do it. (I can’t, but I’m sure you probably can!) Hee, hee. Hmm. 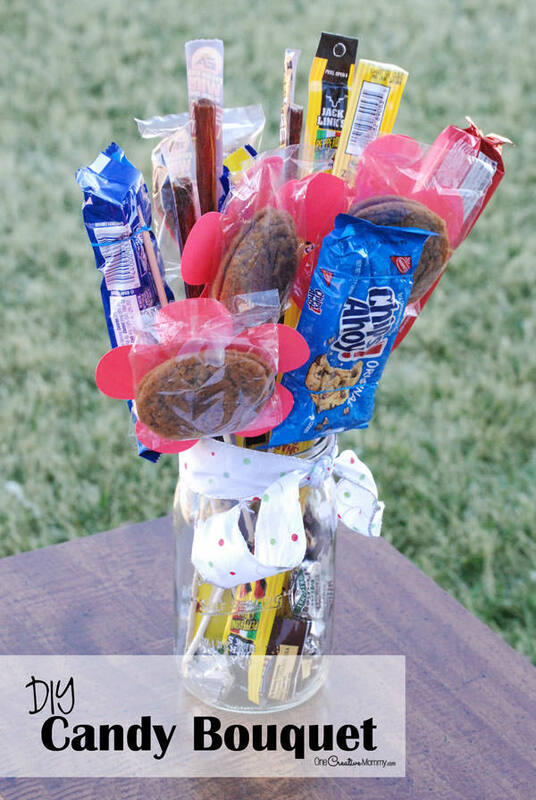 Maybe I need a man bouquet for Mother’s Day next year! Those treats look mighty good! Thanks so much for stopping by today. While you’re here, be sure to check out some of my other ideas for Father’s Day. I hope you’ll stop by again soon! This is totally great! I showed this one to my seven year old daughter since his father would be coming next month and she told me that she’s going to follow these steps. 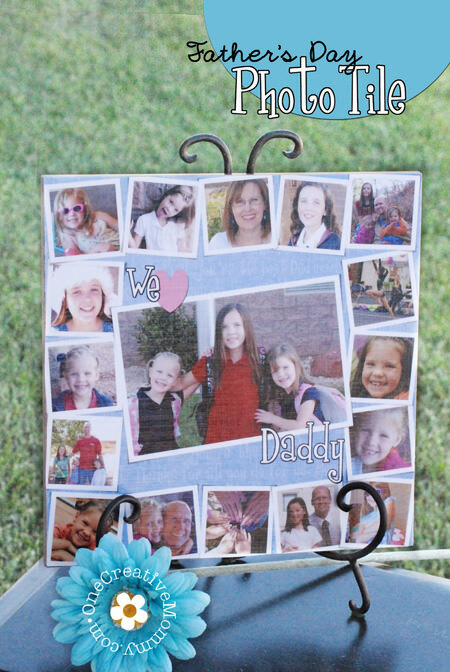 What a fun project for your daughter! My kids liked helping with mine. Have fun! What a terrific idea – I used to always be stumped as to what to get my darling husband when he was still with me! Am about to become a grandma though, so when that happens, I’ll know what to give my son-in-law! Thanks! I’m so sorry you lost your husband. This would be perfect for a son-in-law! Thanks, Jess. It’s a toss up which I’d rather get . . . flowers or treats! So cute! I especially like the flowers : ) Thanks for sharing! Thanks, Megan. The kids made their own this year and skipped the flowers, but I like them, too. How fun! I always have a hard time getting stuff for my husband – but now I know :) This is perfect!! Thanks for the inspiration! You’re welcome, Stacey. Thanks for taking the time to comment! It always makes me happy to hear from readers. This is a good idea! My husband would love it! I hope he likes it, Emily! 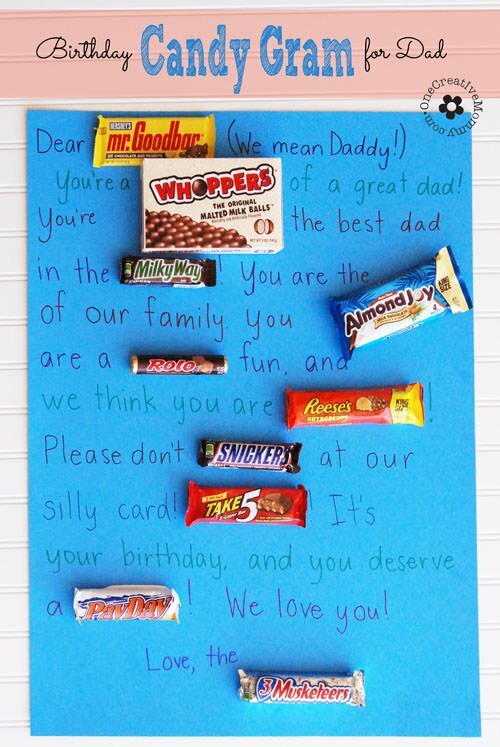 Although here in Greece Father’s Day isn’t so popular, i found this idea great and very easy! I will probably do it! I didn’t know you were from Greece, Martha. So fun to have visitors from all over the world! Thanks for sharing with us at Family Fun Friday. Your post is being featured this week! I hope you’ll stop by and link up again. This weeks party starts this afternoon. Thanks so much, Danita! Don’t know how I missed this last week! Such a cute idea! Thanks for linking up with us at the Create Link Inspire party! You were featured today! Im so excited, Amy! Thanks so much! This is a great idea and just perfect for Father’s Day. I might have to give it a try if I can round up enough candy before Sunday! I’d better get working to get something ready for Sunday, too! Thanks for taking the time to comment, Clare! What a good idea for gift giving. My Dad is always hard to shop for, so I could make up a bouquet of his favorite snacks. That would be perfect, Jennifer. That’s why I like this idea so well. It’s one size fits all! Awesome idea! My dad would love this and it makes a really cute gift from the grandchildren. Thanks! My kids made their bouquet all by themselves this year. It would be great for the grandkids, too! I should have had my kids make one for Grandpa!